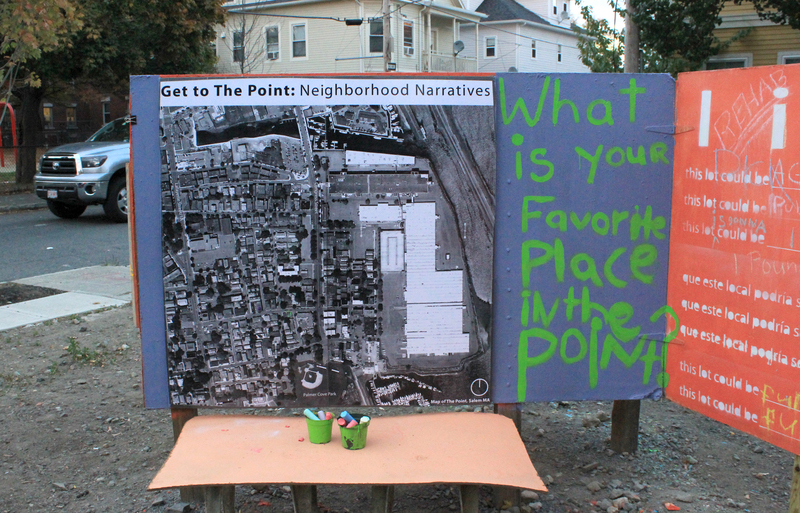 Soon after moving to Salem, Massachusetts, I began to investigate and make art interventions in the nearby Point neighborhood to get to know more about the much maligned area; over the course of a year, I learned both of the pessimism and the fragmented community efforts to improve the neighborhood. In the fall of 2013, I seized an opportunity to facilitate a public participation project on a small, blighted lot in the neighborhood. On this privately owned, but abandoned parcel, I hoped a project could inaugurate a public space for community action, with an eye towards self-expression, and perhaps also a sense of empowerment, ownership, and stewardship. For eight consecutive weeks, every Friday afternoon, I established a ritual where residents could gather and help built a fifty-foot bright orange suggestion wall that eventually read: “I imagine this lot could be…” in both English and Spanish. In an area with chronically low voter turnout, the “Imagine A Lot” project inspired over ninety suggestions written on its bright panels. The “ReImagine A Lot” dynamic participation project seeks to engage residents to imagine what an abandoned lot could be. The project consists of two parts that reinforce each other: the first part is a physical component that provides the space for civic-social events; in turn, these social events provide the workforce to create and maintain the physical component. Over the course of eight weeks, various stakeholders helped build a mural, a community bulletin board, stump seats, and a fifty foot suggestion board. The civic-cultural events included: the Point Neighborhood Association meeting in the open air, a recycling presentation with games, and a community barbecue with local band The Dejas. The project collected community-supported suggestions for the permanent transformation of the space. The project occurred in the open over the course of eight weeks every Friday from 3 – 6 in the afternoon. This provided the opportunity to create a ritual. Kids regularly came and asked if they could help. Eventually, people knew and expected it would happen at its regular time on Friday afternoons. The installation provided participants with an outlet for creative and productive civic work. The physical project provided people with the opportunity to ReImagine what this abandoned lot could be. The civic-cultural events provided the opportunity for social interactions. As for the long-term opportunities, it is still too early to tell. The abandoned lot is located in the densest neighborhood in Salem MA. The Point neighborhood suffers from an image problem, which is perpetuated by outsiders and insiders alike. One of the challenges in creating public art is also its potential destruction. At the beginning of the project, some residents expressed concerns that it would, in fact, be destroyed. Happily this never happened; we imagine it is due to the fact that the community itself participated in building it. Several weeks into the project, one young participant told me of how she witnessed some young boys throwing rocks at the project. She said she went and stopped them since, after all, she “had helped paint it too.” Over two short months, community helpers began to emerge. Carlo, a third floor neighbor who had looked on the progress for several weeks, came down one Friday afternoon and gifted a painting he had made to add to the walls of art. It was to Carlo we went when we needed an outlet to power The Dejas’ performance the day of the BBQ. Click here for project documentation on Salem Public Space Project. We will determine the permanent best use(s) for the lot. We will have community support to realize the project. We will have the support to maintain it once it is realized. We will have a great working model for how we can do this again. If we do it again in the same neighborhood, residents are already familiar with the “dialogue” nature of the project and we will build trust, relationships, and a stronger community.